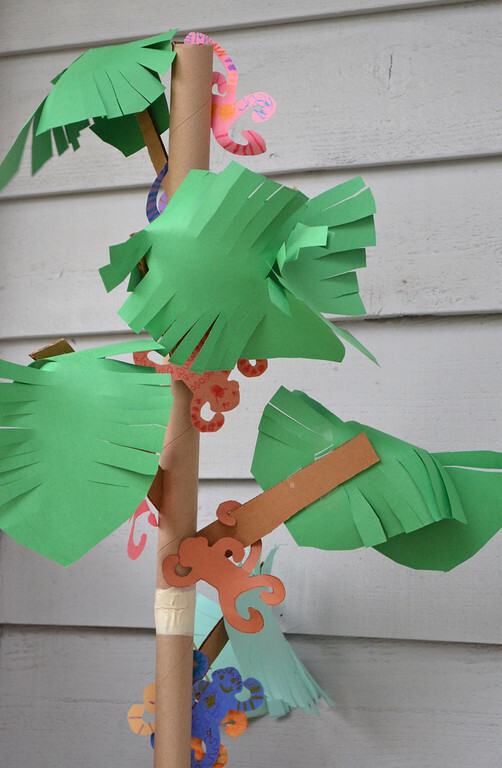 Let me tell you about that time Emily decided to make a tree. 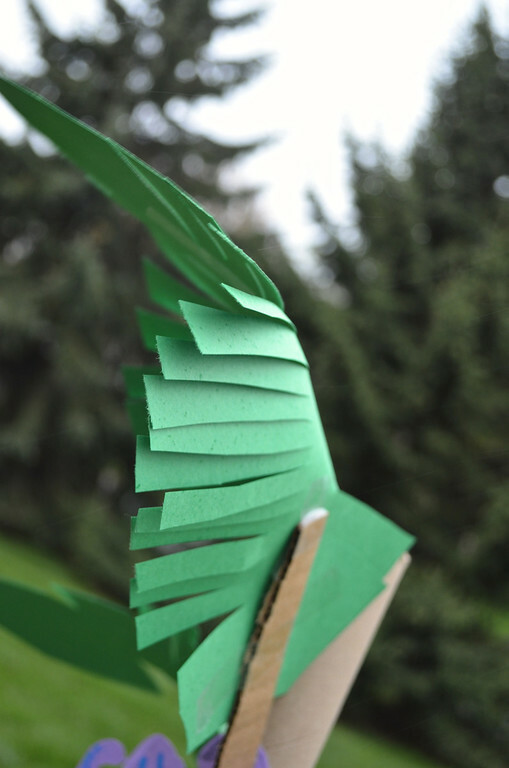 It was Palm Sunday, and she was inspired to make palm leaves. 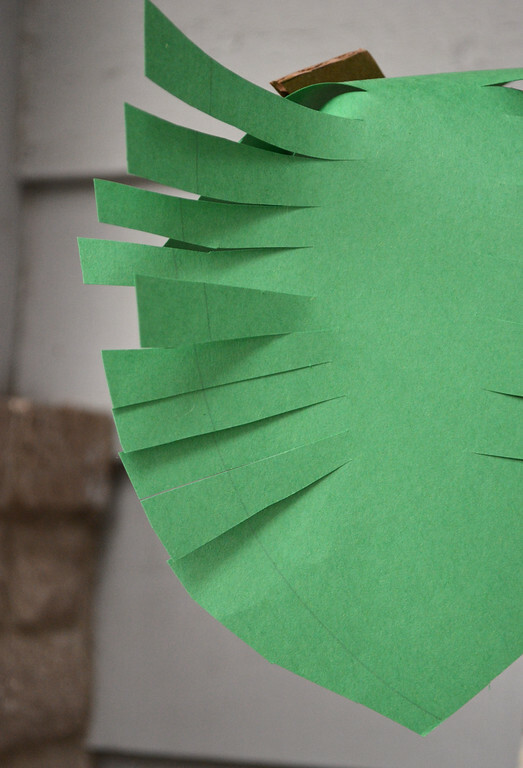 She cut pieces of green construction paper to shape, and made slits all over. 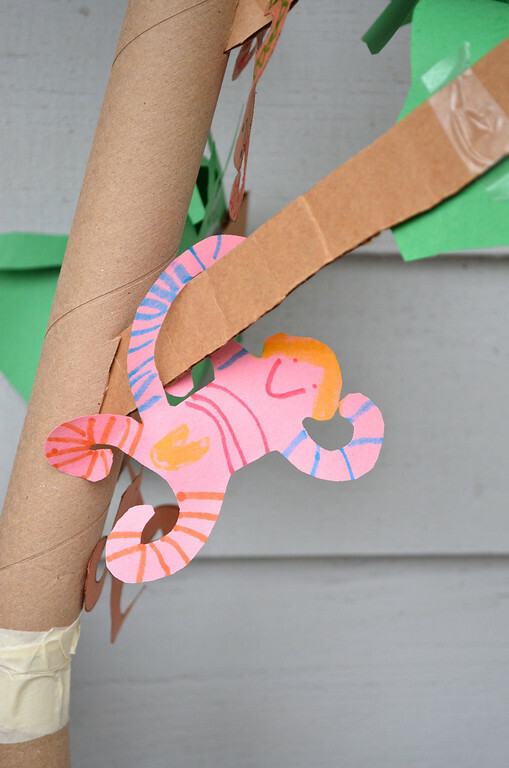 Then she glued on strips of corrugated cardboard for stalks so they could be slotted into the tree trunk, in which she had me cut slits. 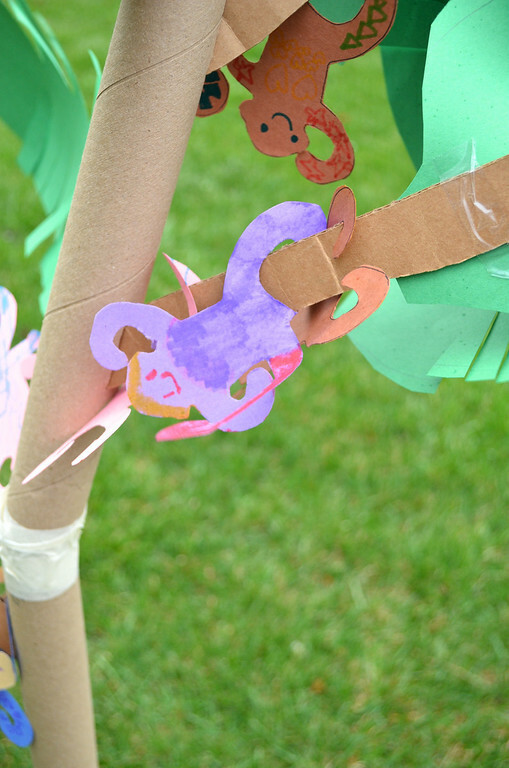 Then she taped tubes together and rammed them into an amazon box, and had herself a tree with detachable palm leaves. 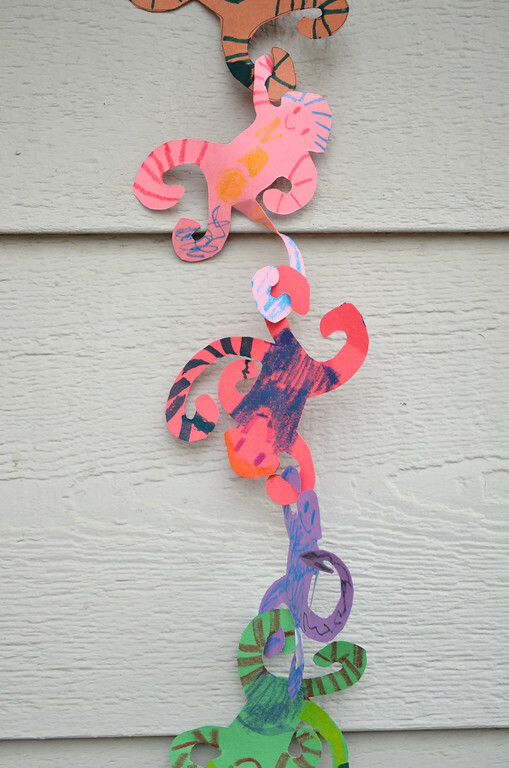 And that tree stood in our playroom for a long time, after which it became infested with monkeys (but no, this is not our playroom; this is the siding of our house). Most of them were happy monkeys, but occasionally, some were very sad. Like that brown one, whose heartbreaking story is (if I remember correctly), "the boy monkey is crying because he was making a bracelet for the girl monkey and he was going to give it to her but she snatched it and that was very mean, so he cried." 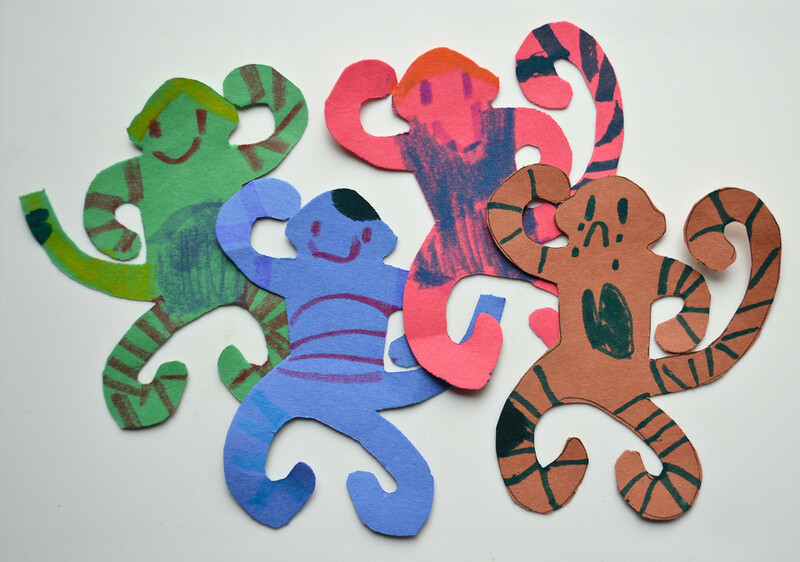 Yesterday morning Jenna asked if they could make monkeys. I said okay because I couldn't think of a reason why we shouldn't (I also couldn't think of a reason for why we should, either, but it seemed harmless and I wasn't about to suggest a more exciting alternative). 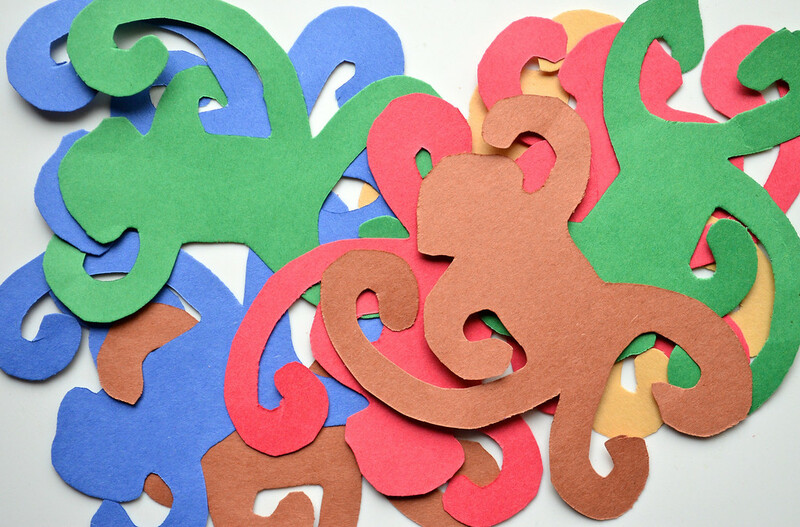 So we cut out monkey shapes in construction paper and the girls decorated them. "You can hang from each other, too," Jenna told me. "Because of their curly hands and legs and tails". This is what happens when the kids direct the crafting in our house. Thought you might like a window into their minds. I like it. I just watch, and step in when there are blades involved, and then step out again. 5 Nutella sandwiches = That was a very involved dress. 1 Nutella sandwich = I serged all around the edges of a fat quarter and called it a handkerchief. 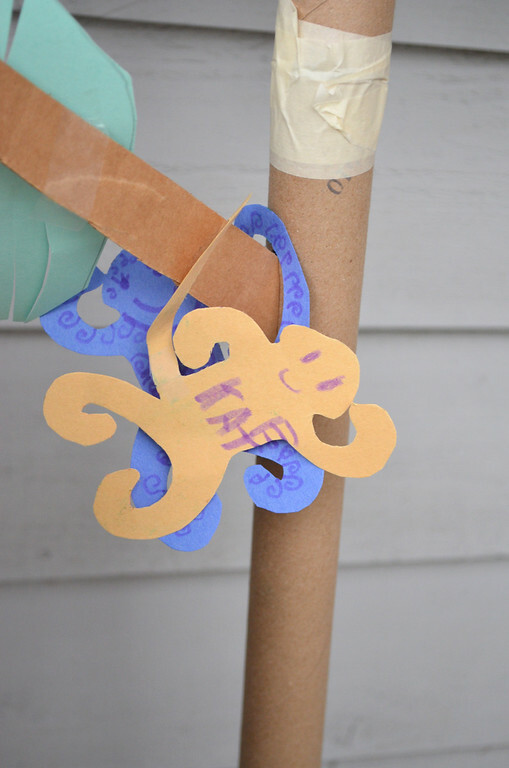 What units of measurement do you use for your crafts? I measure my crafts in nap-times. Hehe! I don't measure difficulty of projects, just whether or not I can work on it while the kids are awake and yelling at the tops of their lungs. Sometimes, you post something, and while there are several little snippets I could say, I can pretty much sum it up with "I love you." Yeah, I think of your crafts as advanced. My kids are so entertained with a dirt hole in the backyard (no joke). 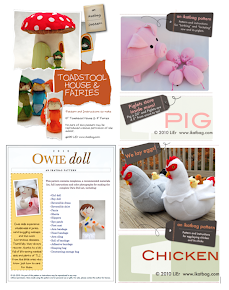 However, the kid in me gets insanely excited by your crafts, so I love looking at what you do. I measure my projects more on how much I have to pay attention. That's why I like to have some complicated and some simple projects on tap depending on how sleep-deprived or tired I am. "infested" with monkeys;I like that. I have some of those red plastic monkeys that came from the game (I stole them from a friend's ki) a they hang in my houseplants in odd places. hmmmm...maybe they need some paper friends. 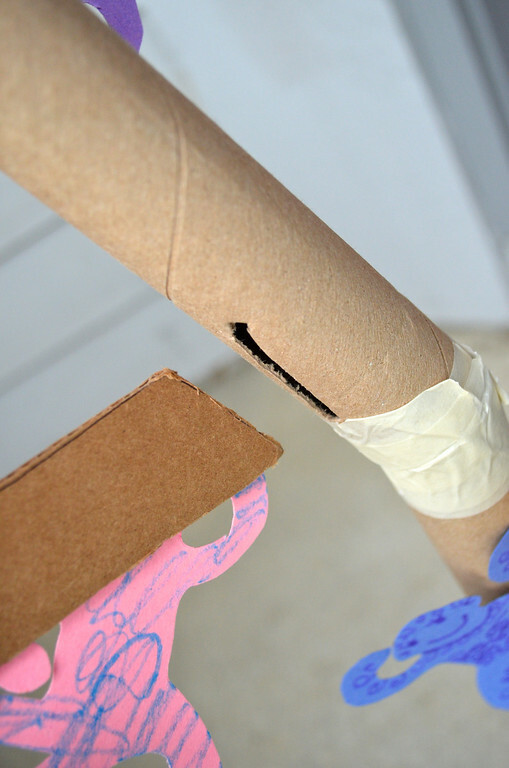 My kids are a bit older than yours, I use easy and more difficult crafts interchangeably (this month I plan to introduce them, and myself, to the power miter saw, welding and sewing pockets). I measure my projects by mess: "hey, we finished and got everything put away... can't wait to show Dad" to, "gosh, this is taking longer than we thought, but I think we can push everything into a corner until we work on it again" to the most used, "Oh My! We've barely even started and look at this place!! Dad will be here any minute, how are we going to hide this mess?!?" I absolutely think you should start ranking your projects according to Nutella sandwiches. Priceless. I am often flummoxed by internet people saying they can't do this and they can't possibly learn how. 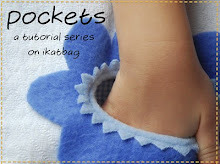 The idea of a tutorial on how to lower your sewing machine pressure foot sends me to the psych ward in my mind. I then thank my lucky stars to have had parents who made things work out, who taught me how to find out how to make things work out and the ability to teach my own kids never to say, "never". Or the dreaded words said in a whine, "I can't". Instead, I taught my kids how to whine properly so they could laugh at themselves. For measuring purposes, I am always involved in at least three projects at one time - from difficult - will take weeks/months to complete (re-upholstering that chair) to simpler - (obtaining the first book of the Hunger Games w/o paying for it). Congratulations on being asked to do the Family Fun thing. Hello! This is great! 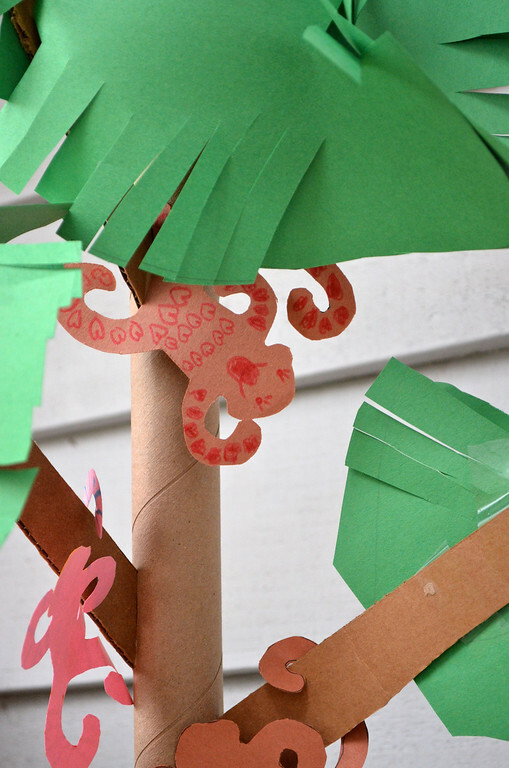 I love the simplicity of the tree and the fun elements--monkeys!! 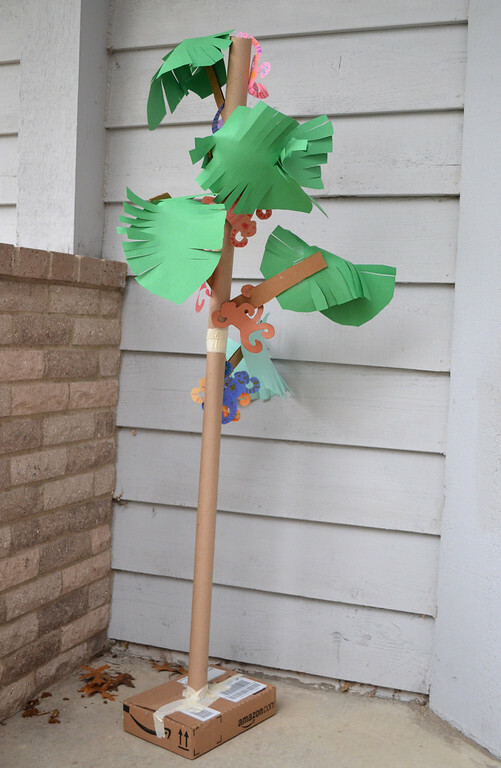 I made this tree (http://hannahleeme.blogspot.com/2011/10/tree-project.html) with my students, and through the project, I got to meet many good people. One of my good friend (http://saynoodle.com/) thought of me after seeing your tree, and gave me your link. Thank you so much for sharing great ideas!